Who doesn't love S'mores in the summer! One of our four year old classes at preschool makes a cookbook for a mother's day gift. 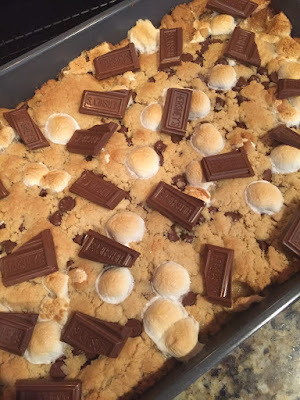 This fun recipe came from one of those four year olds and her mommy! Enjoy! I thought it was great! Cream 1/2 cup softened butter... adding sugars and beat until fluffy. Mix in egg and vanilla. Combine flour, baking soda and salt and add to butter mixture, mixing well. Once this is all combined, fold in chocolate chips and mini marshmallows. Spoon cookie dough evenly over crust. Bake in preheated oven for about 12 minutes. 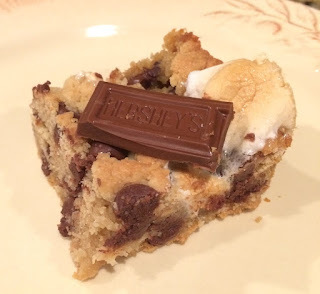 While bars are baking, break Hershey into sections and place in freezer. After 12 minutes of baking, take cars out of oven and sprinkle with some mini marshmallows. Return to oven to finish baking and lightly brown the marshmallows. When tester comes out clean, remove from oven and gently place Hershey bar pieces on the top of the bars. Let cool completely before cutting. Enjoy!